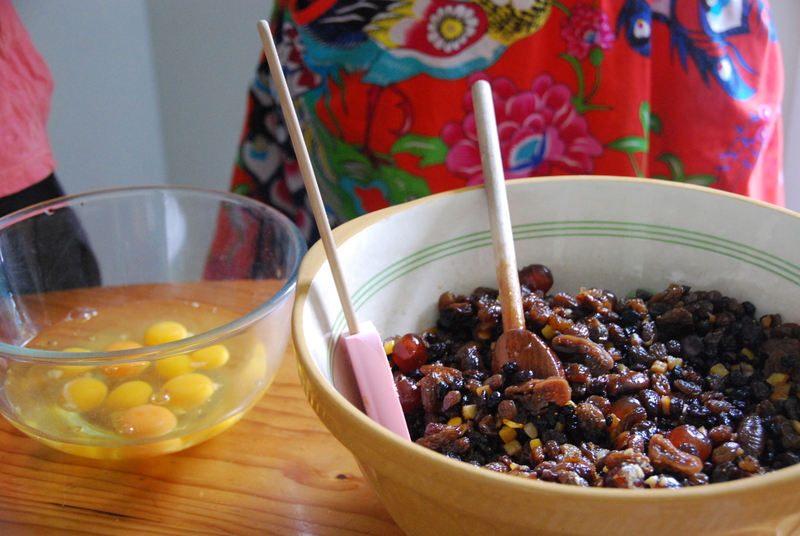 The pudding bowl is on the table, filled with luscious dried fruit and glace cherries, soaked in rum. As my daughter and I arrive for the family Christmas tradition of “pudding day”, there is much excitement over the breaking of a double-yolker egg. That must be good luck! An omen that this Christmas pudding will be a great one. Soon we are involved in each step of making the pudding. The eggs and butter are beaten. Small faces – the youngest generation of four in the room – are pressed close to the proceedings, eyes wide. 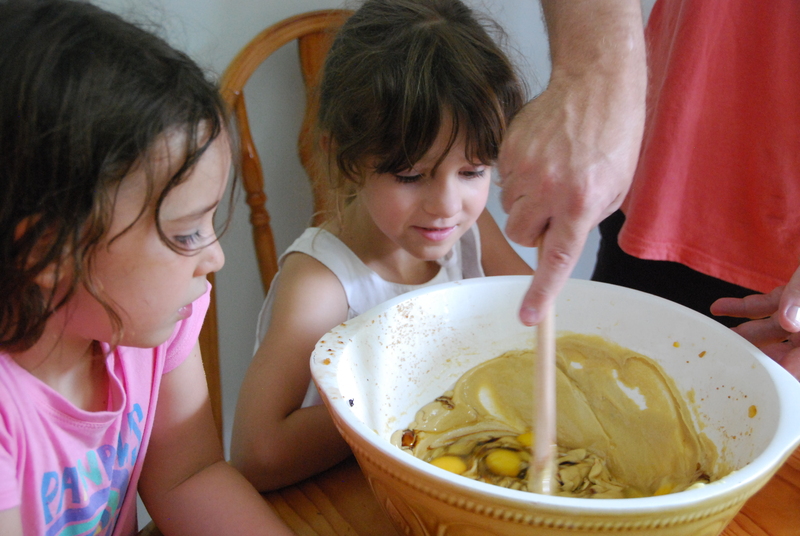 Their uncle Matt is in charge of the wooden spoon; a bit of muscle is needed to stir this mixture. 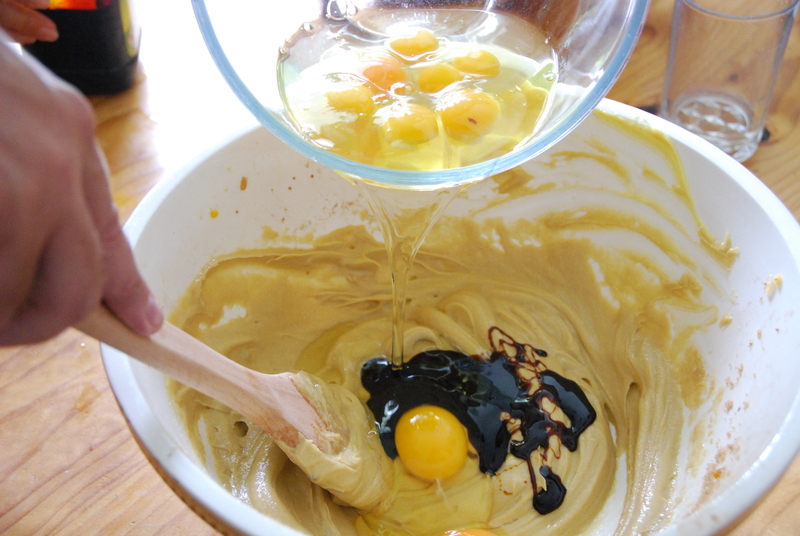 More ingredients are added: brown sugar and treacle. The kitchen is full of rich spicy fragrance, mingled with the aroma of rum in which the fruit has been soaking. Glace ginger and slivered almonds are added to the fruit mix. 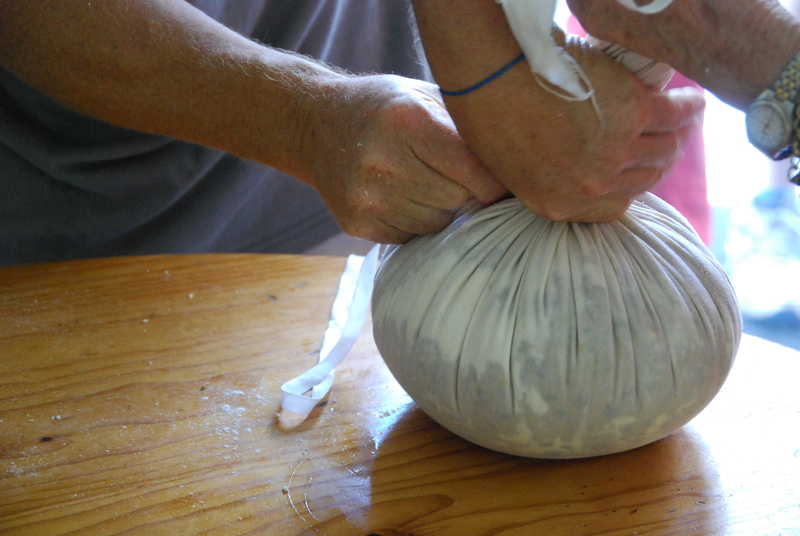 Flour is sifted, and the fruit tipped into the wet mixture. More stirring. There’s a recipe, of course, but this pudding-making is no ordinary event. 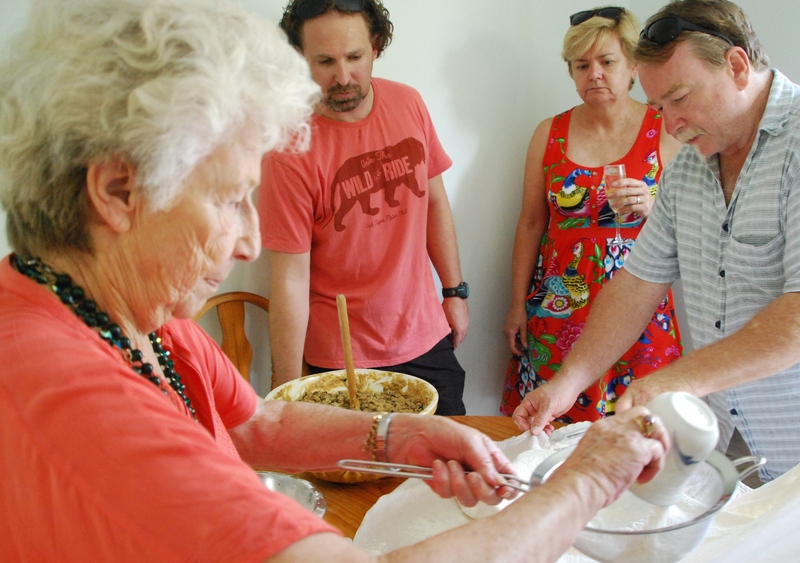 This is a family tradition handed on over generations, and with it comes important rituals, overseen by 81-year-old Esme, whose grandmother and great-grandmother before her have passed them down. Silver sixpences are produced. Dulled by years of use (and saved for just this purpose after the advent of five cent pieces made of nickel and copper), they are handed out. 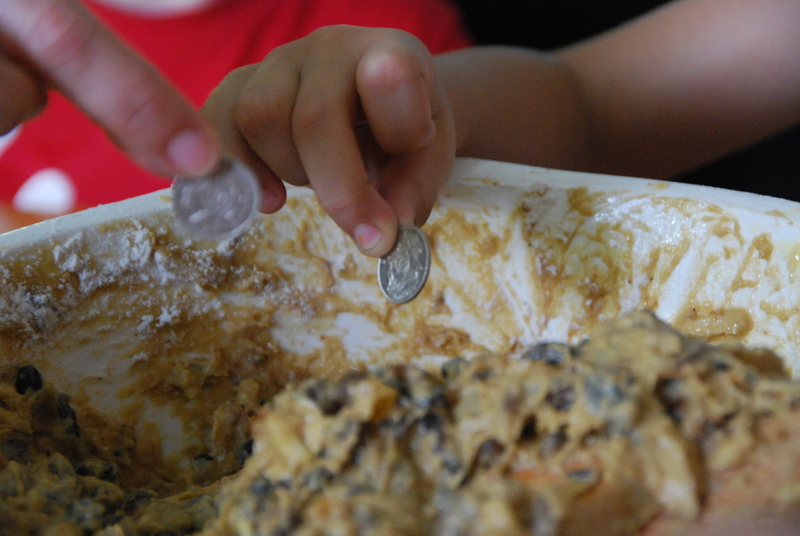 We each get a sixpence to make a wish on as we put it into the pudding mix. My nephew Matt stirs, as I add my sixpence. Some of us add sixpences for absent family members. “This one’s for Christine,” says Paul, for his partner doing family duties elsewhere today. “For Sophie,” I say, tossing a coin in for my Melbourne-based daughter. “For Charli and Chrissy,” says Matt, his wife at home looking after their sick daughter. “For Melita, for Maddie.” Around we go…I add another silently, for my late sister Anne, whose children and grandchildren I’m here with. Then there’s more stirring. 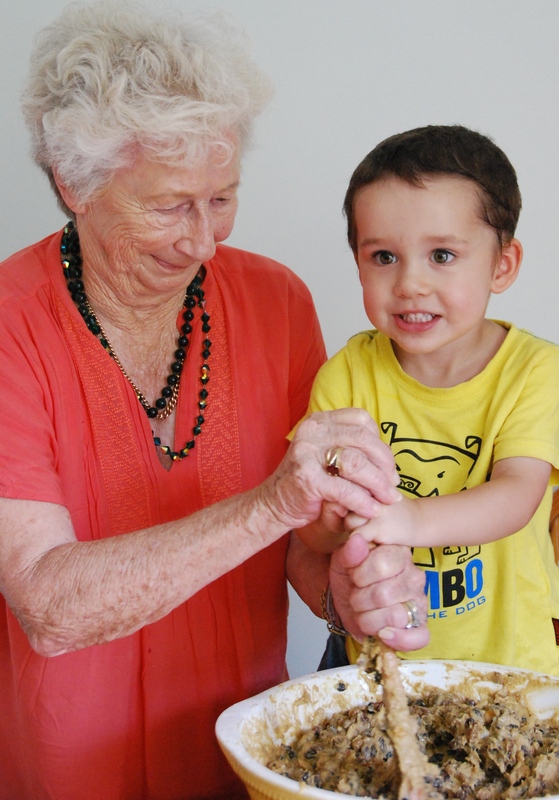 The littlest members of the family join their great-grandmother to stir, and everyone who wants to gets a turn. A swathe of calico cloth comes out. It’s time to wrap the pudding. Esme enlists her sons Paul and Michael to help wrestle it into shape. Five-year-old Keira holds the white ribbon that will tie the top. It’s done! 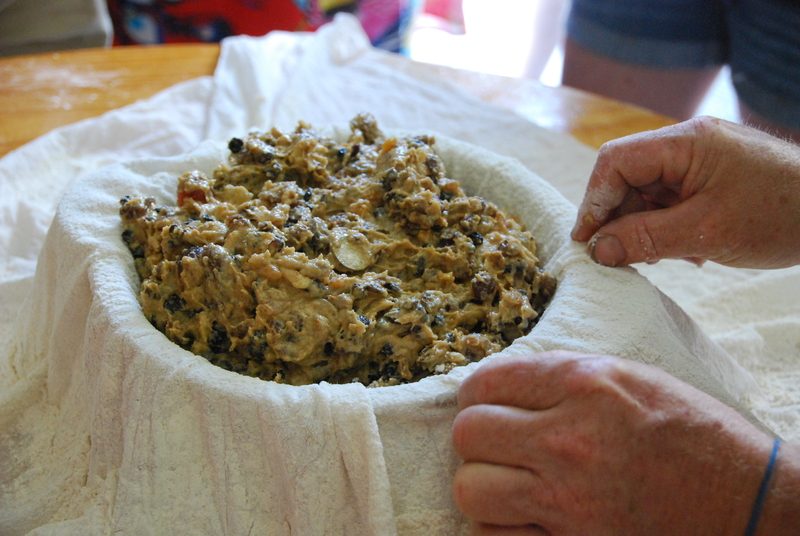 Just one more tradition: the wrapped pudding is held out to each person, to be patted. Small hands and large complete the task, and the pudding is finally ready for the pot, where it will boil for about four hours. One final thing must be done. There’s a bowl to be licked! Michael carries the bowl around and fingers trace through what’s left of the mixture, delicious even raw. Champagne is poured, beers opened, and we retire to the shade of the garden for lunch. Another successful pudding day achieved. I’m asking questions because this is my first family “pudding day”, despite the fact that I’ve been part of this extended family for many years. Not everyone makes it every year, just those who are available, and somehow it’s eluded me until now. Modern families come in all dimensions, and ours is no different. Over the years, our family has changed size and shape, losing and gaining members; there have been births, deaths, divorces, new partnerships and marriages. The ties that bound us in Paul and Christine’s kitchen today were different for everyone. Some of us by birth, others by choice, connections made with each other through those closest to us and bound tighter as the years have passed. 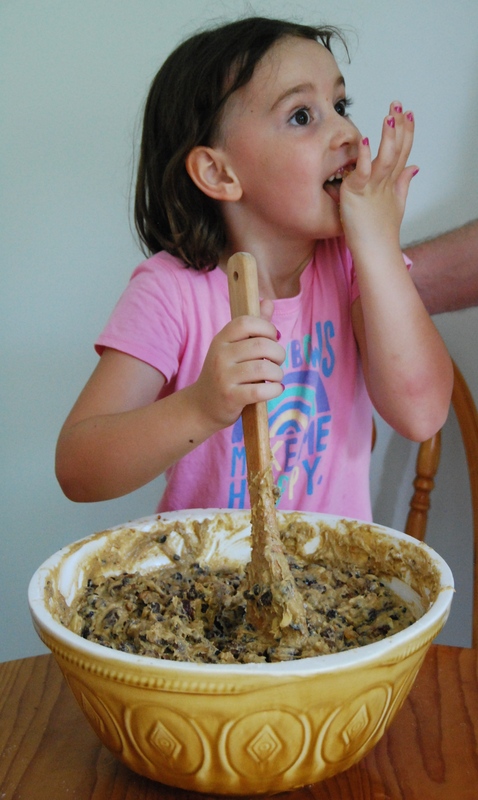 The pudding made with love will be shared on Christmas Day, by some of those in the room today and by others who were not – family and friends. I’ll be holding him to that! My family has Christmas traditions going back to the north of England, but it is a long time now since we have been involved in the making of the puddings we tuck into on Christmas day, topped with hard rum butter and hot white sauce. 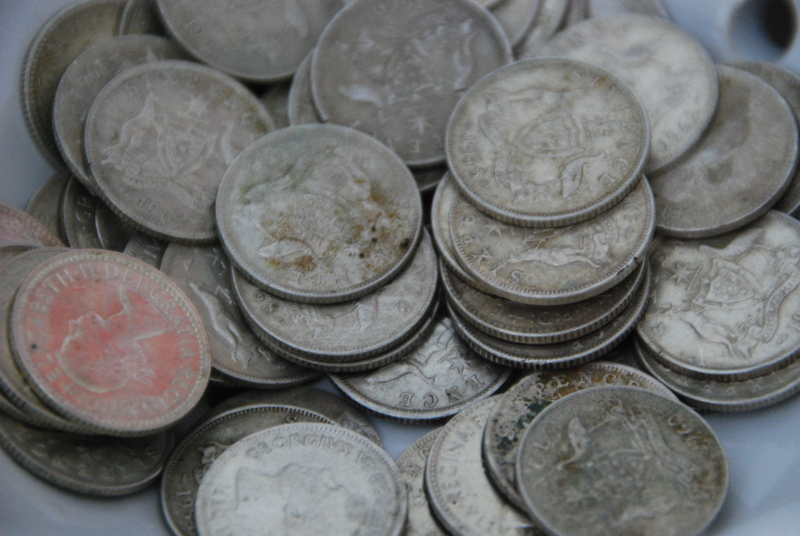 My mum made them for many years, and I remember the stirring and addition of coins which we retrieved at the table. When Mum tired of cooking her sons-in-law took over (it’s a good thing that all the men who have joined our family can cook because two of the three daughters are hopeless in the kitchen). My sister took on the white Christmas cake, which we have preferred to the dark variety since I can remember and is again baking that this year. My nephew’s soon to be wife is making the mince pies, having apparently been told how the Ball family likes them! And Simon, my husband, is cooking the main meal. 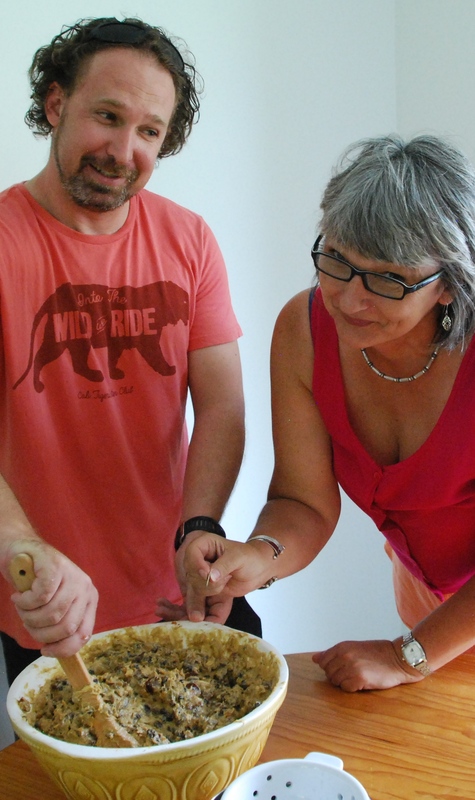 My first husband Enda took on the puddings when Mum stopped, making them to his Mum’s recipe – he’s Irish so it of course includes Guinness – but adapted for Australia, with the addition of ginger and macadamia nuts. Our marriage didn’t survive but Enda still makes the Ball family puds. He charges now, rather than does them for love, but they still taste fantastic. 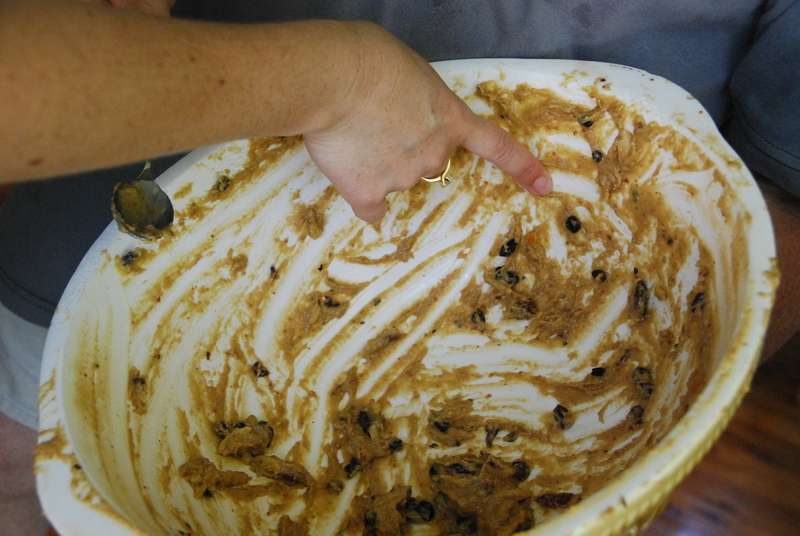 And there’s a lovely sense of history when we dip our spoons into that delicious, thick, fruity treat! A white Christmas cake! I’ve never heard of that, Melanie, but I’m intrigued. I remember the first time someone served me a slice of (dark) Christmas cake with a slice of cheese on top – that was their tradition, and I’d never struck that before either. How interesting it is. And I love the idea of the Guinness in the cake too. It sounds like your Christmas will be a feast – and I wish you and your family a very happy one. I love this whole family tradition! The generations together is something that doesn’t happen often enough anymore, at least here in the States. A lovely Christmas message. And a wonderful story. Let the tradition prosper. Make a pudding for me next year – please. Thanks. But what about a New Year Pudding? That will do. A new tradition? New Year pudding it is, then! More Pud. Go the Pud. I just love christmas celebration.Its so enduring and refreshing.